About Restoration Gardens Inc. - Commercial and Residential Green Roofs - Restoration Gardens Inc. About Restoration Gardens Inc. - Commercial and Residential Green Roofs - Restoration Gardens Inc. Restoration Gardens Inc. is a full service company for both commercial and residential green roofs. Owned and operated by Leslie Doyle, LEED AP, GRP, RGI offers design, installation and maintenance throughout the GTA and Southern Ontario. With a background in landscaping and natural building, Restoration Gardens Inc. emphasizes ecological design and sustainable construction practices in our green roofs. Where applicable, we strive to create green roof systems that efficiently integrate with related building systems, including water and energy usage. 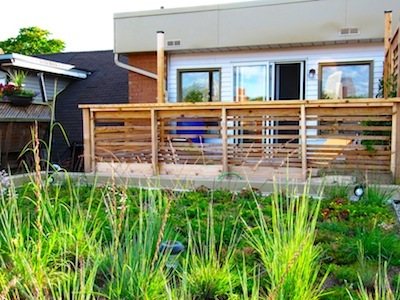 For homeowners, Restoration Gardens Inc. will work directly with you to create a unique green roof suited to your site, aesthetic and functional desires and budget. We also offer a variety of maintenance packages. So whether you’re an avid gardener or one who would rather spend their time enjoying the view, let us work with you to ensure you get the most out of your residential green roof. For architects, landscape architects and contractors, Restoration Gardens Inc. can help you achieve your client’s goals. We offer design reviews and consultation services, assistance with permit applications or can be hired as a full installation contractor. We also offer a range of maintenance packages.